There’s no doubt about it: FC Barcelona is more than just a club! 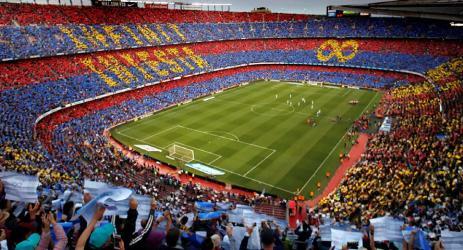 Don’t miss the chance of an exceptional experience, attending a match at the Camp Nou football stadium. You will buy at Official Ticket Agent for FC Barcelona tickets, who offer tickets for all matchs at the Camp Nou stadium. There are various category tickets at different prices to choose from, with seats in; longside, shortside, covered and uncovered areas of the ground. All ticket prices include VAT. The absolute best are the Official VIP tickets located in the Presidential Row. From this area you will have a perfect, panoramic view of the pitch from a padded seat as well as access to the exclusive VIP Lounge with free bar, food & hostess service included. Definitely a privileged environment from which to watch FC Barcelona’s players put on a great show and demonstrate their superb strategies on the pitch. Be a part of it! Book now for the unforgettable experience of watching an FC Barcelona home match live.